Are you all aware of the site Homeschool Freebie of the Day? They have a new freebie for homeschoolers every weekday (except when they take a vacation), and some of these are even homemaking type freebies, like the one for today is. 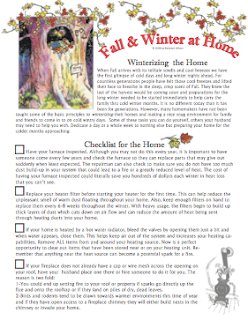 Today’s featured Homemaker’s Mentor ebook contains several short lessons to help you get your household ready for the cold weather months, including: A Fall Checklist for your Home; Defrosting the Freezer; Favorite Pumpkin Recipes; Making a Draft Dodger for your Home, and How to Make Jerky. Hi Catherine! I'm sure you meant to comment on this post http://www.blessedhomemaking.com/2016/11/marriage-is-not-hard.html and yes, such beautiful truths from your mama! Congratulations on your upcoming marriage--so wonderful!